Antigua and Barbuda with its capital Saint John's is located in North America (Caribbean, islands between the Caribbean Sea and the North Atlantic Ocean). It covers some 444 square kilometers (2.5 times the size of Washington, DC) with 94,731 citizens. English is the official language used in Antigua and Barbuda. Thiscountry has no land-based border with any other country. Antigua and Barbuda are two Caribbean islands (Antigua, pronounced an-tee'-gah and Barbuda), that form a country that lies between the Caribbean Sea and the North Atlantic Ocean, east-southeast of Puerto Rico, off the coast of South America. With few other natural resources, the climate is tropical marine with little seasonal temperature variation. The islands experience hurricanes and tropical storms (July to October), and periodic droughts. Early settlements by the Spanish and French were succeeded by the English who formed a colony in 1667. Slavery, established to run the sugar plantations on Antigua, was abolished in 1834. The islands became an independent state within the British Commonwealth of Nations in 1981. To reach someone Antigua and Barbuda dial +1-268 prior to a number. The local cellular networks are operated on 850 MHz, 900 MHz, 1900 MHz, 3G, 4G. Websites typically end with the top level domain ".ag". If you want to bring electric appliances (e.g. battery chaarger), keep in min the local 230 V - 60 Hz (plugs: A, B). The sign for the locally used currency Dollar is XCD. 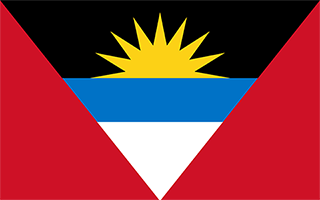 Red, with an inverted isosceles triangle based on the top edge of the flag; the triangle contains three horizontal bands of black (top), light blue, and white, with a yellow rising sun in the black band; the sun symbolizes the dawn of a new era, black represents the African heritage of most of the population, blue is for hope, and red is for the dynamism of the people; the "V" stands for victory; the successive yellow, blue, and white coloring is also meant to evoke the country's tourist attractions of sun, sea, and sand.